Released this today. 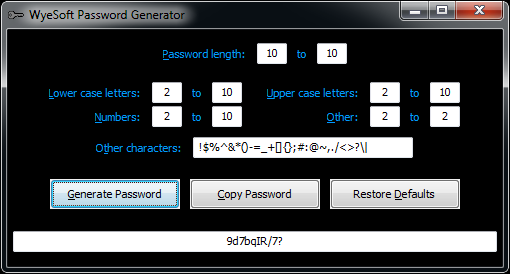 It pretty much does what the name suggests - generates random passwords for you. You can customise the length of the password and what types of characters you want in it. Useful if you're running game servers or some other kind of online service that needs regular password changes, though I wrote this mainly just to test out wxLua, which I am now in love with and will be using a lot.